This bilingual publication includes essays by guest curators Bertha Aguilar, Alejandra Olvera and Sandra Zetina. It is also fully illustrated and presents over 75 color images, including all the pieces exhibited as well as many others. 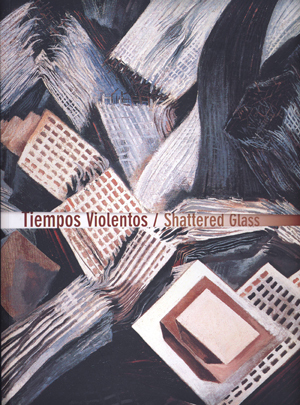 Shattered Glass is the result of a joint project between Americas Society Art Gallery in New York, the Graduate Program in Art History at the Universidad Nacional Autónoma de México, and the Museo de Arte Carrillo Gil. The purpose of this collaboration is to enable graduate students to structure and intervene a Mexican Museum public art collection. The objective was to find links within a group of works that span from different time periods, which refer to the contemporary experience of violence. Amongst the 39 pieces included in the exhibition are works by David Alfaro Siqueiros, José Clemente Orozco, León Ferrari, Gunther Gerzo, Daniel Joseph Martínez, Mireia Sallarés, Pablo Vargas Lugo, Helen Escobedo and many others.